Maserati of Baltimore staff and crew just loves M.O.B. 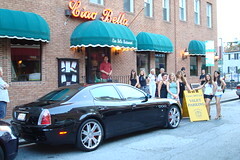 Exotics nights at Ciao Bella Restaurant, deep in the heart of Baltimore’s own historic Little Italy. Join the fun and bring the family. Visitors and guests from our dealership are encouraged to give owner and Chef Tony Gambino a call two hours ahead when they are planning to come downtown, “to make a ROCK STAR PARKING reservation”. Charm city’s top chef is charming says all our his own special guests and all of our VIP clients. In a quaint but chic family “old world” environment, Tony serves up some of the freshest seafood and finest traditional Italian dishes around. Be sure to mention you are one of our clients, and he’ll make sure your car has front door parking with Valet guards all around. To view their menu specials or to inquire about their hours for lunch or dinner, visit www.cbella.com. They also do office lunch, dinner, and special event catering. We’re telling ya’… Ciao Bella is one of the best places in the world to visit. Baltimore City residents are lucky to have them around. 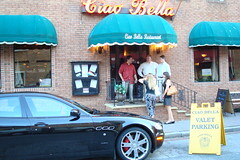 One visit to Ciao Bella Restaurant to dine with Tony, sister Lisa, and cousin Michael and you’ll feel like B-Town royalty.